1 furniture cover : cotton ; 8 x 11.5 x 7 in. 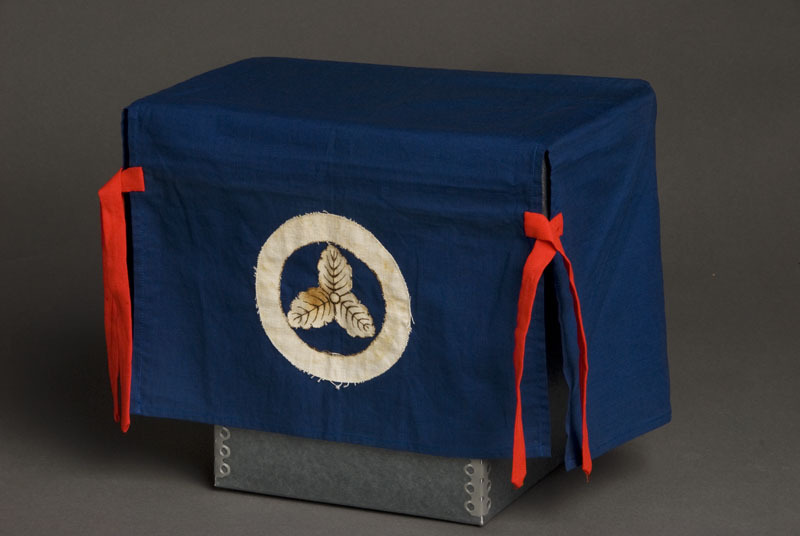 Small royal blue cotton yutan (furniture cover) the size of a toaster cover with red ties (7.5 x 0.675 in.) on sides and white appliqued mon (family crest) of oak leaf cluster (4.5 in. diameter) for bride's dowry. The crest was hand drawn on natural muslin fabric and stitched by machine onto the front of cover. There is a set of ties on each side at front. Side panels are attached at the top to long piece of fabric that composes front, top and back panels (23 in.). Back panel (22.5 x 59 in.) is shorter in length than the front. Note, blue dye rubs off.